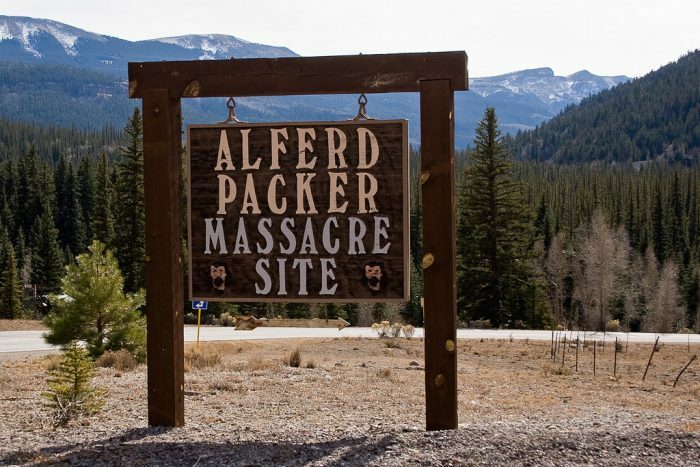 We may never know what really happened to Alfred Packer (aka The Colorado Cannibal) and his prospecting party in the cold, cruel winter of 1874, but what we do know is this unlikely folk hero and his gruesome legend will live on in infamy, and you can visit his gravesite at the Littleton Cemetery any old time you want. 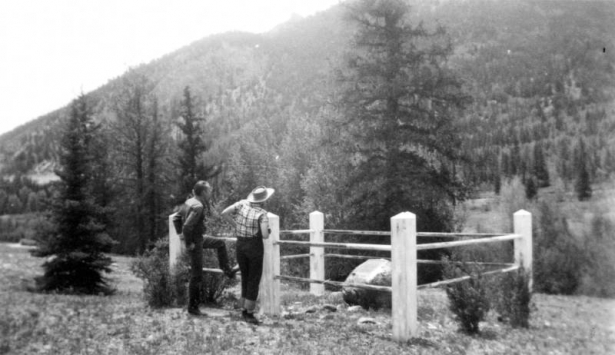 Despite warnings of harsh winter weather, Packer and a group of five other gold prospectors headed into the San Juan Mountains in February of 1874, and what happened next remains one of our state’s greatest unsolved mysteries. 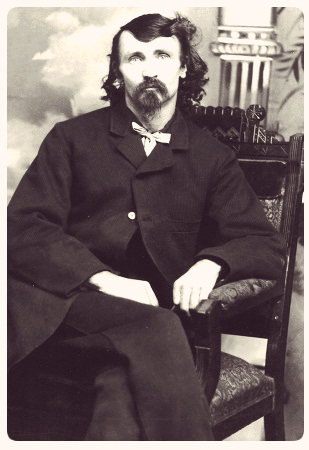 Packer emerged from the woods in April of 1874, alone and reportedly carrying money, a rifle, and a skinning knife belonging to members of his party. 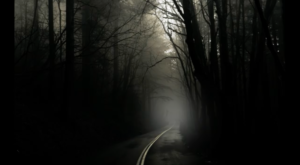 Suspicions were raised, confessions were made, and a tangled tale of murder, cannibalism, and conviction would follow. 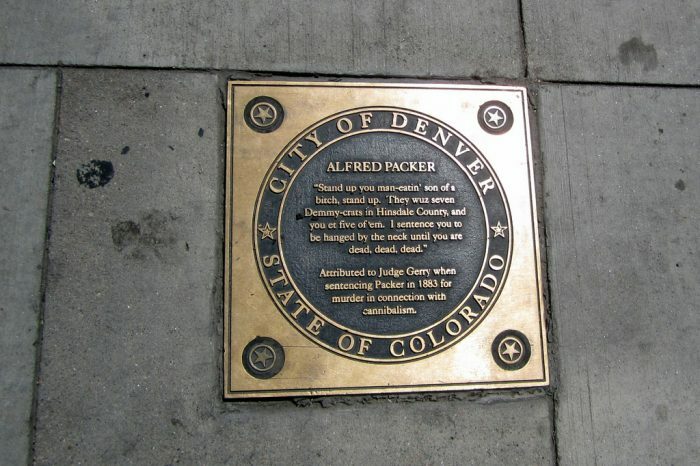 After honorably serving in the Union Army during the Civil War, Alfred Packer relocated to the Rocky Mountains and joined a group of nearly two dozen prospectors in 1874, who were making their way from Utah to Breckenridge, CO, in search of gold. 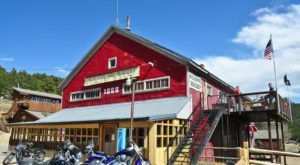 Somewhere near the present-day city of Montrose, Packer and party encountered Indian Chief Ouray, who warned of the high country's harsh winters and urged the men to stay with his tribe until the spring. Stubborn and restless, Packer and five other men set out in February in search of the Los Pinos Indian Agency near Gunnison, but only Packer would make it out of the notoriously fateful journey alive. 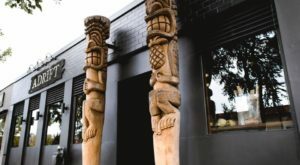 When Packer showed up at local saloons two months later, fat, healthy, happy, and in possession of money and weapons belonging to members of his mysteriously deceased party, suspicions began to swirl. In May of 1874, Packer signed his first of what would be three different confessions with three very different stories. 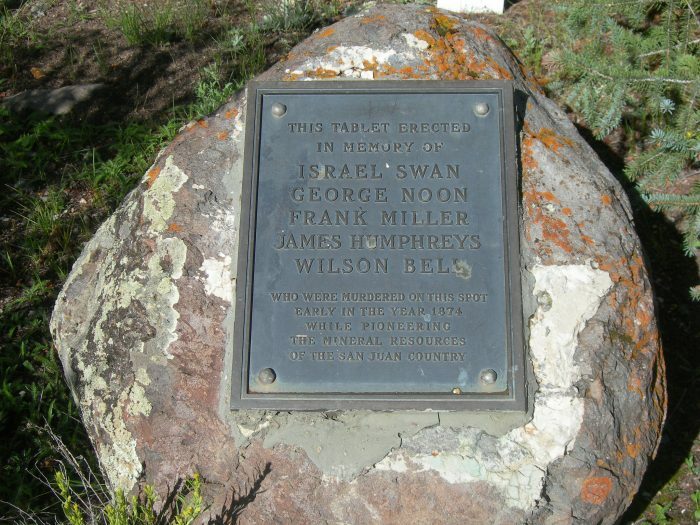 He initially claimed that the group became lost and snowbound, and three members of the party died of natural causes and were consumed by the other members as a matter of survival. 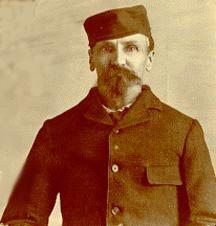 He later stated that fellow prospector Shannon Bell shot George "California" Noon, and Packer was forced to kill Bell in self defense. But for those who heard his sorted stories, facts just didn't seem to add up, and Packer was promptly jailed and charged with murder. 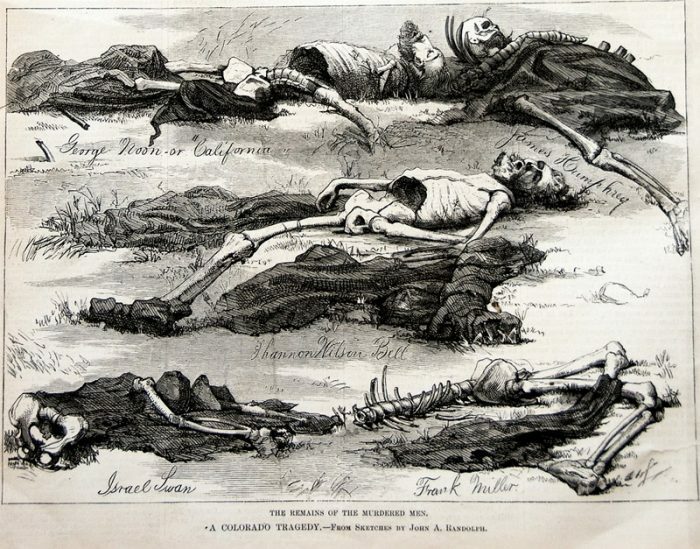 In August of 1874, the corpses of the five ravaged men were found near Lake City, and some reports even state that strips of human flesh were found at the site. 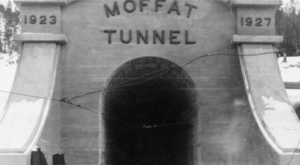 However, in yet another strange and mysterious turn of events, Packer managed to escape from jail and elude the law for nine years, until he was apprehended in Wyoming in 1883 and brought to trial. 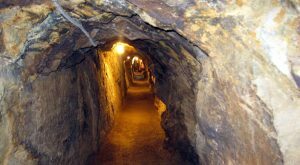 Alfred Packer would ultimately tell three twisted tales of the events, the latter two claiming that Shannon Bell became mentally deranged and murdered the other party members with a hatchet, and that Packer himself was forced to kill Bell in self defense. 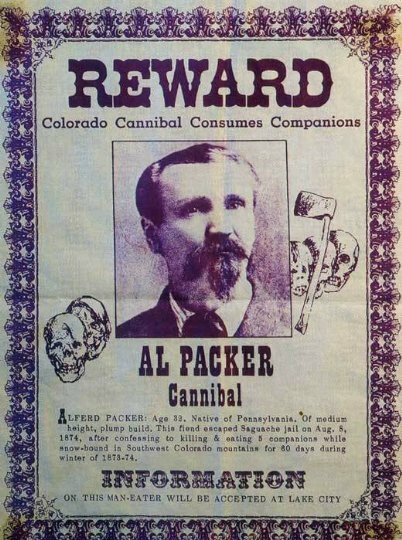 While the three versions of Packer's story vary wildly, the one common thread of murder and cannibalism remains. See Packer's full confessions here. 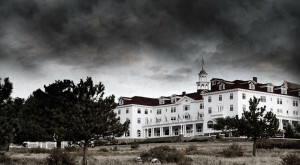 Packer was never actually hanged, and in fact, in 1885, his initial ruling was reversed, and he was sentenced to 40 years for five counts of manslaughter. 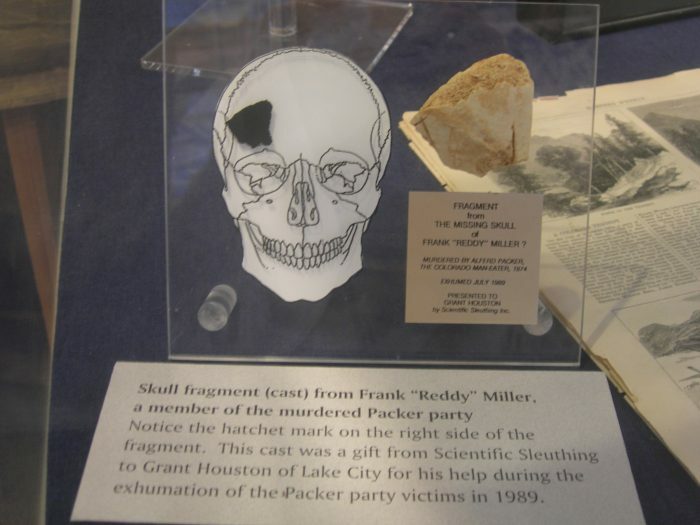 I urge you to visit the Colorado State Archives, where you can review all of the materials from Packer's trials and form your own educated opinion of what happened. 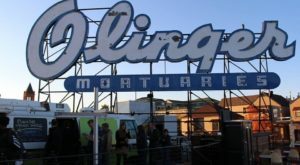 But in the end, one thing is sure: Five men died agonizing deaths in the cold, cruel mountains, and we will never know for certain what horrible fate befell them. 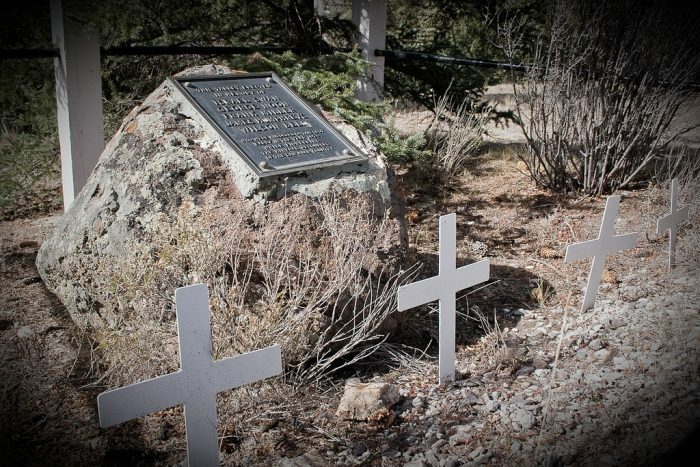 Today you can visit the victims' memorial and scene of the crime near Lake City, Colorado. 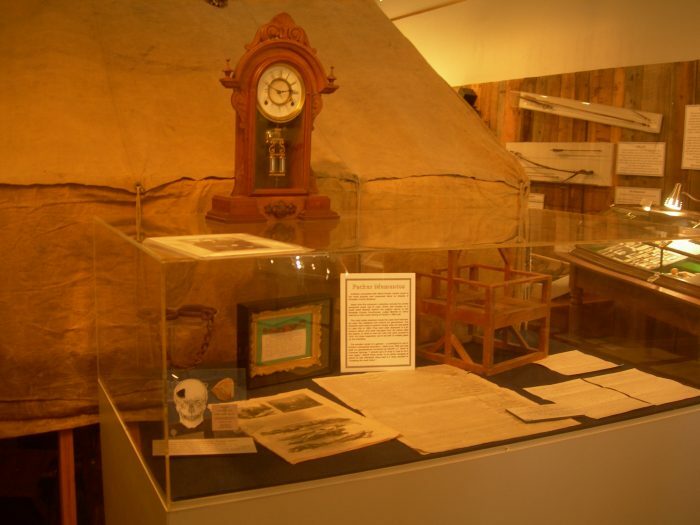 You can also visit the Hinsdale County Museum to view memorabilia and artifacts related to the tragic event. 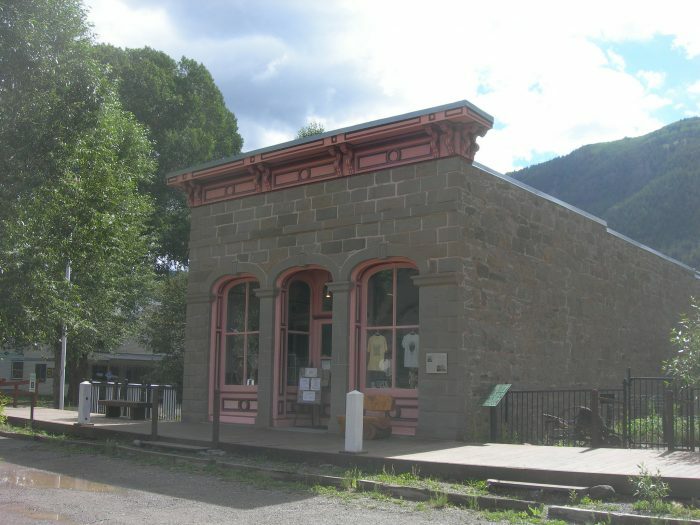 In 1901, Packer was paroled, and he settled down in Jefferson County just outside of Denver, where he quietly lived out his days and "was loved by the neighborhood children, to whom he distributed candy." (Well, that's a whole other level of creepy.) 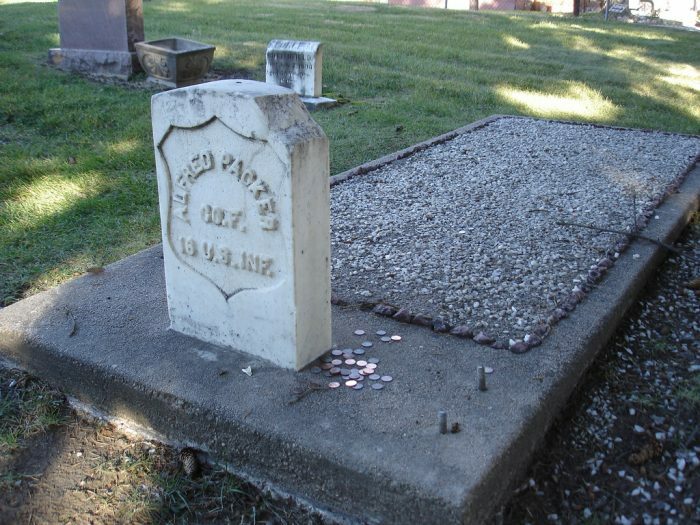 Packer reputedly died of "senility - trouble & worry" in 1907, was given a military funeral, and is buried at the Littleton Cemetery. 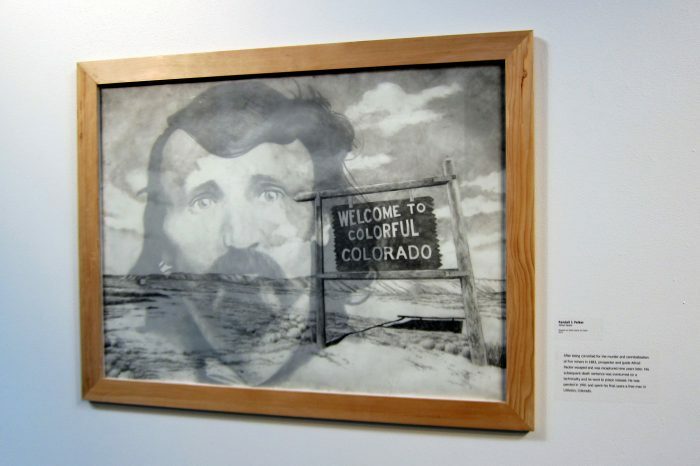 Packer has since become an unlikely folk hero, with many books, films, and comedic spoofs immortalizing his tragically tangled tale, including this work by Randall J. Felker, entitled "Intersections," at the Center for Visual Art in Lincoln Park at 955 Santa Fe Drive in Denver. I strongly urge you to explore the facts (or fiction) for yourself and see if you can discover the real truth behind the Colorado Cannibal! Visit the Colorado State Archives for a chronology of events, digital copies of Packer’s Supreme Court trial, his full confessions, and more! 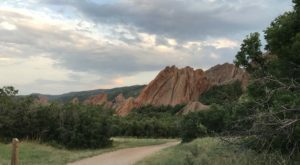 Exploring the wilds of Denver, Colorado, and beyond.